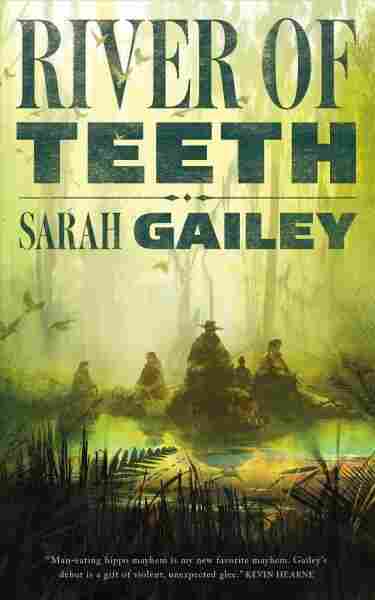 Book Review: 'River Of Teeth,' By Sarah Gailey Sarah Gailey's alternate-history romp takes place in a United States that went ahead with a wild plan to farm hippos for meat. It's a delightful read that suffers only from being too short. In 1909, the United States was suffering a shortage of meat. At the same time, Louisiana's waterways were being choked by invasive water hyacinth. Louisiana Congressman Robert F. Broussard proposed an ingenious solution to both those problems: Import hippos to eat the water hyacinth; then, eat the hippos. Luckily for the United States in our timeline, the fact that hippos are ill-tempered apex predators not amenable to being ranched was pointed out, the American Hippo Bill failed to pass by a single vote, and consequently, we don't have hippos casually chomping on passers-by due to a lack of their usual forage. Sarah Gailey's imagined United States, however, are differently fortuned. Winslow Remington Houndstooth, former hippo rancher, current ne'er-do-well for hire, accepts a commission from the U.S. government to get the feral hippos out of a marshy, dammed up stretch of the Mississippi River. He assembles a motley crew of hippo wranglers — with ancillary skills involving demolition, poison, disguise, and murder — to assist with the job. Unfortunately for them, one man is quite invested in the hungry, hungry hippos remaining precisely where they are — and the bad blood between him and Houndstooth goes back a very long way. I loved the atmosphere and dimensions of Gailey's world. She conveys very well, in a very short book, the length of time since the hippos' introduction, the ways in which hippo-wrangling has changed the character of regions and professions, and the relationship between federal and state governments. All this is deftly indicated in rich, cinematic setting work: the way people ride hippos in and out of waterways; the way hippos stalk and threaten the landscape; the way the world's vices and virtues have bent to accommodate them. 'River of Teeth' is a wonderfully original debut, guaranteed to cast long, sinister shadows over beloved family board games for years to come. That said, I found the characters somewhat ill-served at novella length. As much as the setting has cinematic scope, Houndstooth and his crew sometimes feel like screenplay-shorthand, their conversations as economical as a set design, but equally as stiff. Though wonderful and interesting as collections of seldom-seen traits — a cross-dressing con-woman, an agender demolitions expert, a heavily pregnant assassin, a queer British-Korean cowboy, a lovesick sharp-shooter — I wished they'd had more room to breathe as characters, more room to interact, change, develop, combust. As it is, the story moves from assembling the team to executing the caper with very little time spent dwelling among the dynamics that make heists and capers so much fun to read and watch. Against such a startlingly original and well-realized backdrop, I just wanted more of everything. And yet, the book is fun — the what-if of the premise so excellent, the threat levels and betrayals so sharp, and several passages profoundly moving. Houndstooth's love for his hippo (just look at that phrase!) is genuinely tender, and the trauma for which he's seeking revenge is deeply affecting. Also, River of Teeth is the first half of a duology, with A Taste of Marrow coming out this September, and from what I've seen, I have firm hopes of it stretching its narrative legs a little further. In the meantime, River of Teeth is a wonderfully original debut, guaranteed to cast long, sinister shadows over beloved family board games for years to come.